The view from behind the gray concrete walls of the Oregon State Hospital in Junction City looks out upon the yellow-green bucolic plain of the Willamette Valley to dark green foothills on both sides of Lane County. The view inside the immaculate hospital is of a fresh, bunkered community college, still new-smelling from its opening a year ago. The warm, inviting library is filled with thousands of donated books; the fitness room has new equipment, and the recreation room has new air hockey, ping pong and foosball tables, no knob yet broken. Patients line up single-file in the hospital corridors as staff leads them from lunch to the afternoon’s treatment mall activities, each designed to speed their progress toward the green plains and hills outside. “We believe that everyone is going to get to the point of recovery,” said Shaunia Scales of the Oregon Health Authority, a “lean leader” at the hospital. That means coursework in anger management, substance abuse treatment or art therapy, as well as creating positive interactions with the other patients. It’s a far cry from the bad old days when patients might be routinely kept in restraints or isolated in padded rooms. Those options still exist but happen rarely, and only for those in the more intensive units at Junction City. “We consider any use of restraint or seclusion as a failure,” said Scales. As they improve, patients get increased opportunities to visit the outside world, first to a nearby nature park, then into Junction City, as well as the Coast or Eugene before they are finally ready to leave. The Junction City hospital sees two types of patients — people who are civilly committed because their mental state poses a threat to themselves or others, and criminal offenders who are guilty except for insanity. A third, steadily growing group of patients at the Oregon State Hospital — people who are charged with crimes but cannot stand trial because of mental instability — are only treated at the big hospital in Salem, which has about 600 beds to Junction City’s 150. Junction City today is only half full, although an empty wing will open next month to treat an additional 25 civilly committed patients. The view of the hospital from policymakers and advocates is more mixed — almost every mental health advocate, as well as the legislators who most frequently hammer out mental health policy — opposed its construction. The federal government through the U.S. Justice Department has investigated the state’s lackluster mental health system and forced it into a multi-year plan to clean up its act, with a focus on treating people in the least restrictive environment. Odds are the department will issue their final opinion before President Obama leaves office, and it’s unclear whether they’ll give Oregon an OK. The Justice Department did not intervene in the construction of the new hospitals, but federal policy opposes big institutions as the delivery model for mental health services and Oregon cannot get any federal dollars to support the care of institutionalized patients, even as federal Medicaid dollars pick up the vast majority of healthcare costs they might receive in an outpatient or community hospital setting. “The cost of running it will be huge,” said Bates, who oversees the budget for the state hospitals and put the price tag at $300,000 per patient, per year, all from state dollars. The hospital cost $80 million to build and costs $38 million a year to operate. Bates instead wanted the state to build a bunch of 16-bed facilities around the state to cater to psychiatric patient’s needs in their communities. The state could have counted on federal Medicaid dollars to pay for most of that care. A pilot of that model is opening in Pendleton, site of the former Blue Mountain/Eastern Oregon State Hospital. “Once he [Courtney] makes up his mind, he’s adamant. He wanted a second hospital, and by damned, that’s what he got, even though there was nobody in the mental health profession who wanted it,” she said, including an advisory group specifically set up to address the costs and benefits of two new hospitals. Advocates also objected to the downstate location of the hospital and the closure of the old state hospital in Portland. But 31 percent of the patients at the Junction City facility are from Lane County, and another 33 percent are from southern Oregon. Only 15 percent come from the Portland metro area. 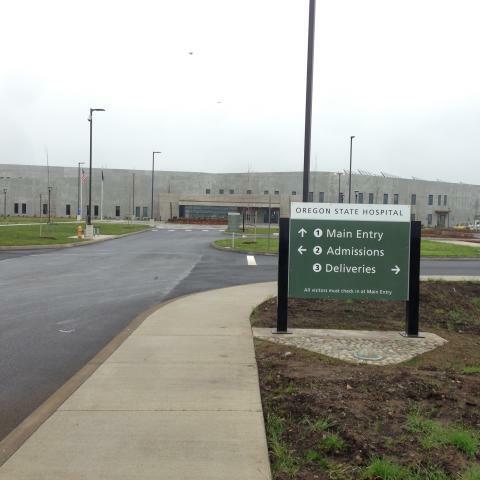 Oregon State Hospital spokeswoman Susan Stigers said only 40 percent of the patients at the old Portland hospital were from the Portland metro area, and those patients were transferred primarily to the hospital in Salem. That’s outside the metro area by most definitions, but at 47 miles from downtown Portland, it’s about the same distance as the Western Washington State Hospital from Seattle. Courtney ignored requests from The Lund Report for comment through his spokesmen, Robin Maxey and Rick Osborn. The master plan had initially come about because of a different set of lawsuits against the state, focused on the abysmal condition and substandard treatment methods at the old Oregon State Hospital in Salem. To stick to his original plan, while pivoting toward the community mental health that the feds, advocates and legislators like Bates and Tomei demanded, Courtney, along with then-Gov. John Kitzhaber, invested many more millions in community mental health, using both a dedicated cigarette tax source that Courtney commandeered from Republicans, and a marked new investment from the general fund. In a press release after the money for the hospital was approved by the 2013 Legislature, Hoyle seconded Courtney’s message for both the hospital and more community investments: “[I] helped secure the $80 million required to build the project. The Junction City Hospital is now under construction, bringing a huge influx of jobs to the area and paving the way for a high-quality acute care psychiatric facility. Those investments have continued under Gov. Kate Brown, but given their reliance on funding from volatile individual income taxes, the community mental health system will be vulnerable in the inevitable next economic downturn, and much easier for future state budget writers to scale back than big hospital operations. Bates said state community mental health services needs to be cut from the counties and handed to the coordinated care organizations, which already have the main stream of Medicaid dollars to fund the system thanks to the Affordable Care Act. State dollars could supplement that money, particularly for stable housing, which the feds are more reluctant to pay for. As a physician, despite the talk of a sea change in community mental health, Bates isn’t seeing anything changing on the ground, at least for people at the outset of a psychotic break. He knew of a patient in need of psychiatric care at one of the Medford hospitals who’d been boarded in the emergency room for two months without treatment. But, Chris Bouneff, the director of the National Alliance of Mental Illness — Oregon, though long a critic of the Junction City hospital, does think the community mental health investments will move the dial. For the view back at the Junction City Hospital, interim administrator Kerry Kelly concedes that the state hospital system is not the ideal place to put individuals, but notes the backlog of people needing intense, acute care. When the new wing opens in May, it will relieve pressure on patients around the state who, like the patient Bates mentioned, are cooped up in local hospitals, often simply in emergency rooms, and need the extra care. It is too bad that the psychiatric staff of the Oregon State Mental Health Division, especially those of the original Oregon State Hospital in Salem were not intensively called upon to help redesign and reconstruct a new, broadly functioning, highly efficient mental health care delivery system that had previously existed in Oregon as recently as the late 1960’s, when, the Oregon Mental Health Program was quietly, but strongly, evolving into just the sort of dynamic diagnostic, treatment (acute, chronic) rehabilitative, and custodial, and more often than not, long term followup care which could often be arranged to follow a patient to continue in care even following their release into the community mental health program (already staffed and program ready to receive them) with easy access to the mental health program set up for them as necessary. A hospital based dispatch office, staffed 24/7 with police empowered personnel, were called at any time the a patient with extended leave status had to be returned to the hospital and protective control. Setting up and defining that functional structure is where the investment of thought and funding is initially needed – not expensive structures that do not fit the need or the job – such as the new hospital program, which clearly did not. Personnel staffing structures are highly plastic and can change in structure with change in use as opposed to buildings and grounds with absolute dimensions.